Numthong Gallery is a gallery located in Dusit and was founded in 1997 by Numthong Sae Tang. From the website: Initially it was a small gallery located in the Bangkok Housing Cooperative Building on Thoetdamri Road, Dusit, Bangkok. For all 15 years of its operation, the gallery has maintained its reputation as one of the leading commercial galleries in Southeast Asia. 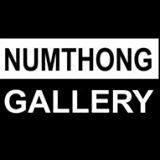 Despite its rather limited area, Numthong has provided exhibition space for a wide range of artists, both the emerging and the internationally-acclaimed figures. It is also a meeting point for co-exhibitions by local and international visual artists. In some years, the gallery hosted as many as eight exhibitions annually -- a proof of its recognition among the audience, artists, students, as well as local and international collectors.